Normal aging is commonly associated with a variety of mild sensory and cognitive declines. 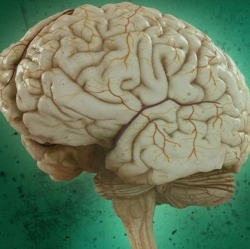 Separate to any acute dementia-related disease, this average age-related brain decline has been commonly thought to be caused by a slow reduction in the total number of brain cells. However, a new study from MIT’s Picower Institute for Learning and Memory suggests that a reduction in the plasticity of certain neurons could be the fundamental cause of normal age-related cognitive decline. The new experiments focused on inhibitory interneurons in the visual cortex of mice. Aging of inhibitory interneurons is a little studied area and these neurons are hypothesized to be crucial to brain plasticity. "Despite common belief, loss of neurons due to cell death is quite limited during normal aging and unlikely to account for age-related functional impairments," the researchers write, in a statement accompanying the new study. "Rather it seems that structural alterations in neuronal morphology and synaptic connections are features most consistently correlated with brain age, and may be considered as the potential physical basis for the age-related decline." The study first tracked the growth and structure of inhibitory interneurons in mice at several key ages. Mice generally live for about 24 months, and while a three-month-old mouse is considered mature, an 18-month-old mouse would be the equivalent of a senior citizen. The initial research found that there was no significant decline in the number of inhibitory brain cells as the animal aged. What the researchers did find though was a decline in several plasticity markers beginning around the age of six months. The growth of dendrites, the branches that connect neurons, was seen to progressively slow down between the ages of three and 18 months. This inability for a brain to dynamically remodel itself is a key feature in reduced plasticity. Another form of plasticity measured is called stimulus-selective response potentiation (SRP). This measurement examines the neuronal process underlying visual recognition memory. When our brains are youthful and plastic they respond potently to visual stimuli but SRP measurements show these responses decline with age. In the new mouse study SRP measurements were noted as robust at three months but barely evident by nine months. The final part of the study set out to see if these reductions in plasticity could be reversed. The researchers utilized a drug called fluoxetine, better known as Prozac, as previous work found it enhanced interneuron remodeling in younger mice. Interestingly, the mice treated with fluoxetine for at least six months, beginning at the age of three months, displayed significant improvements in all plasticity markers, including dendrite growth and SRP measurements. "Our finding that fluoxetine treatment in aging mice can attenuate the concurrent age-related declines in interneuron structural and visual cortex functional plasticity suggests it could provide an important therapeutic approach towards mitigation of sensory and cognitive deficits associated with aging, provided it is initiated before severe network deterioration," the researchers write. While the research offers a compelling new hypothesis behind normal age-related cognitive decline, the suggestion fluoxetine could be a realistic therapeutic agent is not especially practical. The common antidepressant is already not recommended for use in the elderly due to its side effects, and the drug would have to be administered for an extensive period of time from a relatively young age to have any effect. All this is also assuming the drug’s actions are replicated in human subjects, which is something that would take years of complex clinical trials to prove. Perhaps the most pragmatic outcome from this study is the finding that a decline in brain plasticity can potentially be reversed, meaning the kinds of age-related cognitive degeneration we just accept comes with getting older may in fact be something that can be modulated in the future.